It’s been a great few months for Riskalyze as a company. We were named by Fast Company to the World’s 10 Most Innovative Companies in Finance, and out of those nine peers, we’re the only one serving investment advisors. Today, hundreds of advisors across the country are using Riskalyze Pro to win new clients, pinpoint risk expectations and build portfolios to fit them. We’re not resting on our laurels though. Today, we’re excited to announce the launch of a brand new experience for managing risk questionnaires and portfolios in a client-centric view. 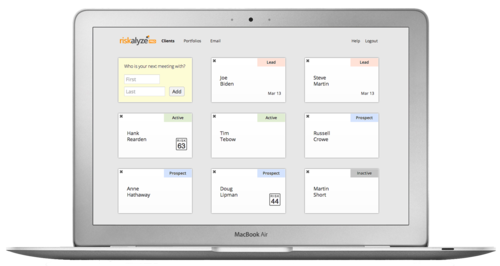 When you log into your Riskalyze Pro account, the Clients tab is now the default view, with a simple set of “cards” that allow you to organize your clients in active, prospect, lead or archive categories. 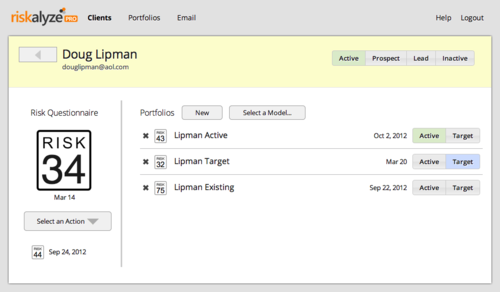 Once you’ve clicked in to a client’s profile, you can manage all of the data for that client in one simple view: all of their past and current risk questionnaires, and all of their past and current portfolios. We’ve also made it possible to see the history of a client’s Risk Fingerprint, and create clients and risk questionnaires without necessarily having the client’s email address on hand. Client profiles are immediately available in your Riskalyze Pro account today, and are included for advisors on the full version, and the Free Plan.